A pair of reports from market research firm IDC on Tuesday showed the iPhone lost ground in Western Europe during the first quarter of 2013, while Android devices bumped Apple's handset out of the top-five in India over the same period. According to IDC's European Mobile Phone Tracker, the iPhone's share of the region's smartphone market fell to 20 percent, a year-over-year drop of 11 percent. Samsung boosted its share to 45 percent, growing 31 percent compared to the first quarter of 2012. Apple's 20 percent share was good enough for second place, while next-closest competitor Sony held 10 percent of the market. It should be noted that the IDC estimates shipments, not sales, meaning a substantial number of units counted may still be in supply channels. Apple's dip may be attributed to an overall slowdown in smartphone sales as shipments increased 12 percent year on year to 31.6 million units, the lowest rate of growth since the firm began tracking the mobile phone market in 2004. Another likely contributor is a rough economic climate, which could bring pause to those considering a premium handset like the iPhone. According to IDC's European mobile devices research director Francisco Jeronimo, the region is now in a "second wave" of smartphone adoption. The first wave was fueled by users who wanted to buy devices that would fill their needs, and were able to afford the performance. The second wave will be driven by customers with little need for such functionality. "These new users are looking to replace their current feature phones with another feature phone, as smartphones are fancy gadgets that they don't feel the need to have. However, when they go to a phone shop most of the options available are smartphones only; their friends, colleagues and family may have smartphones and are always talking about the latest apps, and the cheapest smartphones they note are most likely to be as low in price as the last feature phone they bought," Jeronimo said. "With a small push from sales people, the sale is almost guaranteed. But they will buy one of the cheapest smartphones as they still see no value for money." This may be why manufacturers like LG and Sony boosted their European marketshare by 380 percent and 100 percent year-to-year, respectively. 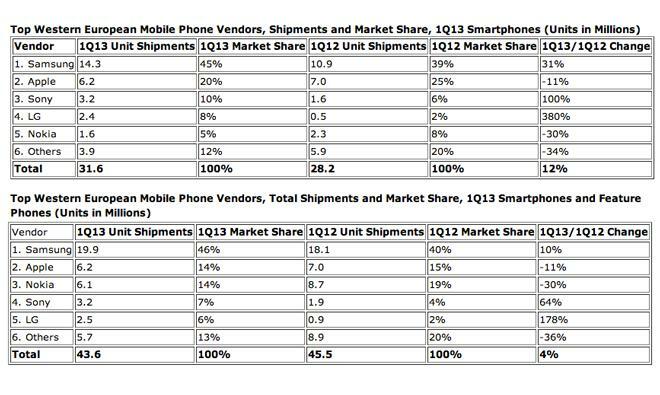 Overall mobile phone shipments dropped 4.2 percent year-over-year. As for the burgeoning Indian market, The Times of India reports Samsung to be in command of that market as well, with Apple nudged out of the top-five device makers as cheaper Android handsets held a staggering 90 percent marketshare. "Apple has always been a niche player in the country," said IDC senior market analyst Manasi Yadav. "Apple numbers in Q4 of 2012 were exceptional but their shipments actually saw a dip in Q1 of 2013 as per our numbers." Domestic companies Micromax and Karbonn took second and third place in shipment volumes, holding around 19 percent and 11 percent of the market, respectively. Apple did make an appearance in the top-five in terms of value, however, as the iPhone continues to be exceedingly profitable compared to Android devices. The company came in fifth behind Samsung, Micromax, Nokia and Sony. 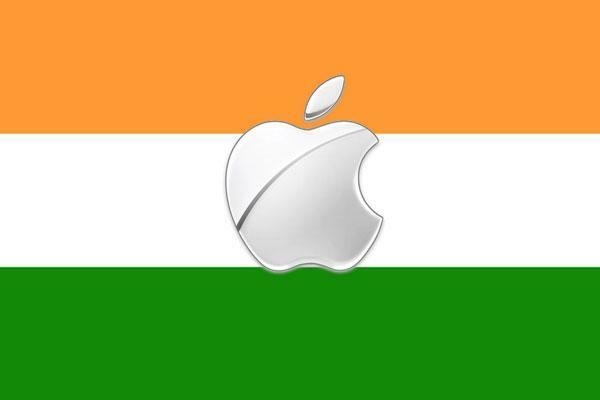 The report is somewhat in contrast with a recent report from Credit Suisse, which estimated iPhone sales in India to have grown 400 percent from February to May, a number identical to IDC's own shipment estimates from February. That boost was attributed to aggressive pricing strategies in the country, including student discounts and monthly installment programs, among others. According to IDC, the Indian smartphone market grew 24 percent in the first quarter of 2013.